The relationship between a patient and their primary care provider are the foundation of health care, and are incredibly important in both preventing illness and maximizing health and wellness. 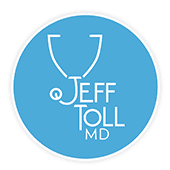 Jeff Toll, MD, and his team provide primary care services with a holistic approach to address your total wellness. His practice is based out of Cedars-Sinai in Los Angeles, where he coordinates your care with top specialists in other medical fields. If you want to work with a doctor who truly puts your needs first, call or schedule a consultation online today. What should I expect from primary care? As your primary care provider, Dr. Toll and his team provide a wide variety of preventive health services, including annual physicals, health screenings, and lifestyle advice to help you improve your overall wellness. However, primary care encompasses much more than your annual wellness visit. Dr. Toll is committed to providing timely, integrated, and high-quality care. He blends an old-school, patient-focused approach to medicine with new-school emergent technologies and best practices. As a result, you receive highly personalized medical care and full attention. Additionally, he provides treatments and care to manage any chronic conditions like high blood pressure or diabetes. If you need specialist care, he writes referrals and coordinates with your other physicians, ensuring you receive the medical services and attention necessary to improve your health and well-being. What should I talk to my primary care provider about? You should talk to Dr. Toll and his team about your life and your health. As your primary care provider, he develops a comprehensive understanding of your overall wellness through honest conversations. He wants to know if you’ve noticed any changes or new symptoms since you last saw him. He also asks about other aspects of your life, including your stress levels and mental and emotional well-being. You can also ask Dr. Toll questions. He’s an invaluable resource for you to learn how to improve your health. For example, if you want to lose weight, but don’t know where to start, talk to Dr. Toll about your goals and he can provide advice and support to help you reach them safely. How can primary care manage and improve my health? During your first visit, as well as subsequent wellness appointments, Dr. Toll provides a comprehensive exam and wellness consultation to get to know you and your health. While he’s checking your blood pressure and listening to your heart and lungs, he also asks questions to get to know you. This information forms the foundation of his assessment of your health and feeds into a customized, holistic wellness plan designed to improve your overall wellness — physically, mentally, and emotionally. His goal is to work with you to improve your total wellness and reduce your reliance on medications by strengthening your body. If you’re looking for a primary care provider who’s truly committed to helping you improve your overall wellness with a holistic approach to healthcare, call or schedule an appointment online today to meet with Dr. Toll.